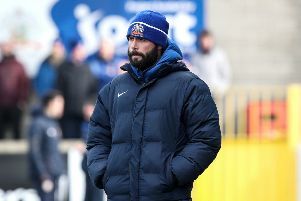 Despite being on top for most of the tie, Portstewart had to make do with a 1-1 draw against Pat McAllister’s Sport and Leisure Swifts on Saturday. At a bright and sunny Seahaven, the Ports put their embarrassing defeat at the hands of PSNI behind them, and put on a pleasing display against a physical Sport and Leisure. In the first half Lee Forgrave had a goal ruled off side and the Ports were denied a clear penalty after Ryan Doherty was up ended in the box. The second half started as the first had finished with Portstewart bombarding the Sport and Leisure defence, however the visitors were the team to break the deadlock when they scored on the break. Chris Hanson tested the keeper on a number of occasion but Taylor’s side just couldn’t find the back of the net. Determined to take something from the game, Portstewart continued to press, and their breakthrough came via a fine strike from Emmet Dysart. After that Forgrave found the woodwork, Doherty hit the bar, and Johnny Stewart had a good effort denied by a good save from the Swifts keeper, as the final score ended 1-1. Attentions now turn to Saturday’s home tie with Tobermore United. Ports coach, Aaron Forgrave described Saturday’s draw as ‘two points dropped’. “We done more than enough to win the game. “Ryan Doherty, Chris Hanson and Johnny Stewart looked dangerous going forward, and our midfield played very well. Tobermore drew with PSNI on Saturday, and are sitting in third spot in the league.